I’m trying to rename a character in my novel and I’d love some feedback! She’s inspired by my grandmother and I am trying to give her a classic, Southern lady’s name. Y’all know what I mean: called by two names, and her middle name is a family last name. Examples: Myra Ware, Sarah Simms, Anne Rogers, etc. Vote for her name here! I’d like something like Myra Ware, which is my grandmother’s name. I love this name, but I using it in my novel is too close to home. My grandmother was called Myra Ware because her mother was named Myra, also—her family called her by both names to differentiate between the elder and younger. Born: 1920 Died: 1980, cancer (multiple myeloma). Unnamed grew up in the town of Fox Valley in Cahawba County, Alabama. Except for college, when she lived in Birmingham, she stayed there all her life. Her father ran Kendrick’s & Gammage’s Drug Store in Fox Valley, and she attended Fox Valley High School until 1938. She wasn’t valedictorian or salutatorian, but her grades still put her near the top of her class. She is a master-tasker and creative spirit. She joined Alpha Lamba Delta in college, served on the yearbook and newspaper staffs, and was a members of several clubs and charitable organizations. 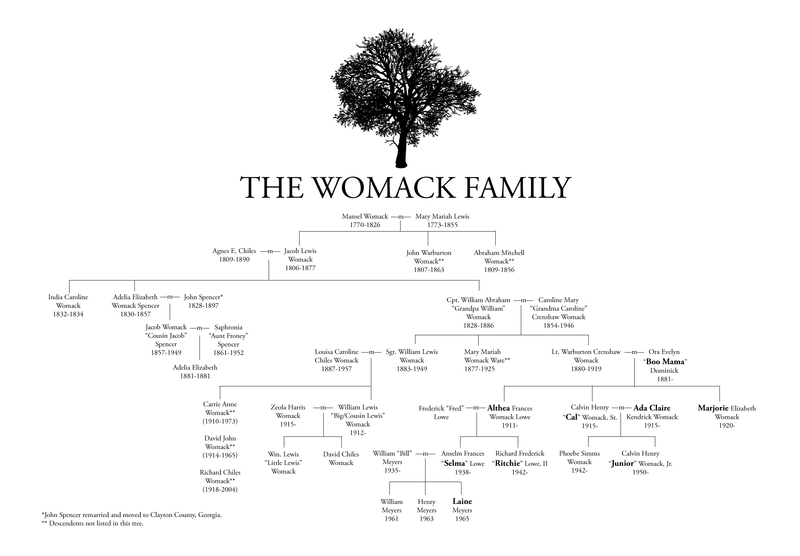 After college, she married her high school sweetheart, Calvin “Cal” Womack. Since Cal was an officer in the Navy during World War II, she lived with her in-laws on the family farm in Cahawba County. After the war, her father-in-law got ill, so she and her husband built a house next door to her in-laws and her husband took over the family farm. She started a career in education, first teaching elementary school during the war, then moving to work in the district’s administration. She served as the first female superintendent of the Cahawba County Board of Education from 1976 until she was diagnosed with cancer in 1978.